Olivia Chow started as the frontrunner, but has now sunk to third place. The belief is that Olivia Chow, while a desirable choice for mayor, is actually undesirable because she will not get enough votes to beat Doug Ford. Doug Ford is in second place. The belief is that Doug Ford is so undesirable as a choice for mayor that people who would otherwise vote for Olivia Chow will vote for John Tory, just to keep Doug Ford out of office. John Tory is the current frontrunner. 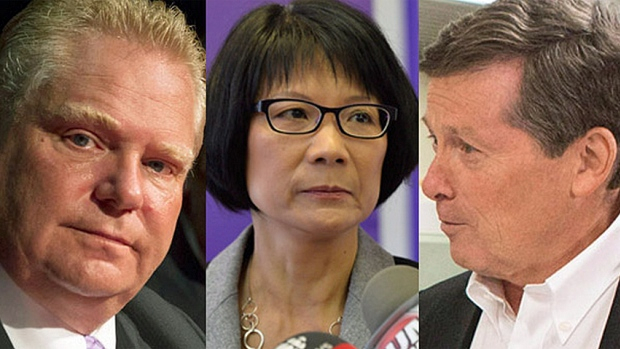 The belief is that John Tory, when compared to Doug Ford, is the most desirable candidate, although without Doug Ford, John Tory is not as desirable as Olivia Chow. If people believe that Olivia Chow will lose if they vote for Olivia Chow, they will vote for John Tory. If people believe that Doug Ford will win if they vote for Olivia Chow, then they will vote for John Tory. If people believe John Tory will win even if they vote for Olivia Chow, she might have a chance of winning. In all scenarios, Doug Ford is the lowest common denominator, the least of all possibilities. But that is more than enough. For the Anyone But Chow scenario, please switch the names “Olivia Chow” and “Doug Ford” that are not in bold.